Oregon political bloggers made front page news in the Sunday Oregon. Jeff Mapes helped review the players and describe how the blogs are changing political communication in Oregon. I wanted to welcome any new visitors by highlighting below some of the best articles and contributors in the past few weeks at OregonCatalyst.com. Who knows, maybe YOU can be our next great opinionator? If you have an idea or commentary you want submitted we would love to hear from you, just email Jason Williams at [email protected]. Your thoughts are more important and needed than you think. Columnist Larry Huss: Did candidate Westlund bow out for other reasons? Steve Schopp: What Transportation vice grip? 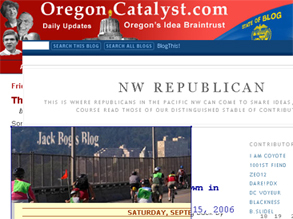 If you want to read the latest from this and other political blogs, and daily political news, you MUST go to OregonWatchdog.com. This site will give you daily political news from across the Oregon media spectrum.